Although he is best known for his International IMPAC Dublin Literary Award winner Out Stealing Horses, Per Petterson's backlist of Norwegian-published novels has provided Graywolf Press with a rich vein of spare, beautiful prose alive with the soft light and sharp chill of Scandinavia. Originally published in Norway in 1992, two years after the death of Petterson's parents, brother and nephew in a fire, this coming-of-age story mines both the adolescent struggle to form an identity and the emotional defense mechanisms built by the grieving to protect them from the pain of loss. In 1965, on 13-year-old Audun Sletten's first day at Veitvet School, the headmaster asks him to remove his sunglasses. Audun simply and firmly demurs, "I have scars." When pressed, he adds, "They're so goddamn terrible." Though he is lying and has no physical scars, he has also told a deeper truth. Audun carries his scars inside, and he has no intention of revealing the stories behind them. Over the next five years, Audun holds tightly to his secrets. No one is allowed to know of the abuse his drunken father inflicted on his family before disappearing; the tragic car accident that took the life of Audun's delinquent younger brother, Egil; or his concern that his sister, Kari, has taken up with a layabout. Only his sister knows the most dangerous secret: Audun has seen their father on the streets of their town and lives in fear that he has come to terrorize the family again. Audun navigates a realm of specters unimaginable to his peers. Even his best friend Arvid Jansen--the main character of Petterson's previous novels In the Wake and I Curse the River of Time--finds Audun an enigma. Arvid especially cannot understand why Audun is considering dropping out of school. But despite his desire to become a writer, Audun worries that he doesn't belong in school. He asks, "Did Jack London finish school... or anyone else worth reading?" Despite Arvid's appalled reaction, as the narrative slides back and forth through Audun's teen years and the occasional childhood memory, Audun feels increasingly out of place in secondary school and unable to relate to his peers, admitting that without Arvid, he would "feel naked and cold and lost in this world." From seventh grade through his employment as a worker in a printing factory at age 18, Audun uses a refrain of "It's fine by me" to disguise his perturbation at the misfortunes of his life and the unfeeling actions of others, even from himself. While readers who need a linear, action-filled plot may not care for the shifting time periods or the emphasis on introspection, readers who love deep examinations of character will find themselves caught in Audun's voice like a ray of light in a prism, their emotions filtering through in a spectrum of compassion, commiseration and admiration. Like Audun's beloved Ernest Hemingway, Petterson's prose is brisk and unornamented, perfect for evoking the austere beauty of the Norwegian landscape and yet packed with emotions both powerful and subtle. Petterson uses Arvid's political activism as well as Audun's musical tastes to create the feel of growing up 1970s Norway, an experience that here appears similar to growing up in America during the same time period. No matter the reader's nationality or background, Audun's struggle to reconcile his own identity with the larger world is easily recognizable to anyone who remembers the difficulties of adolescence. His passion for literature, sensitivity to the trials of his friends and family, and determination to carve his own path give the lie to Audun's claimed acceptance of life's pitfalls. 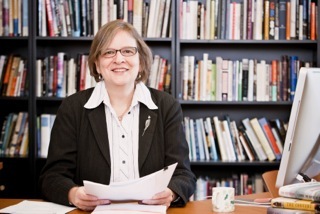 Since 1994, Fiona McCrae has served as publisher and director of Graywolf Press, a leading American nonprofit literary publishing house with many award-winning writers on its list. McCrae took some time from her hectic travel schedule to speak with us about Per Petterson and the process of working with a foreign author. How did Graywolf come to work with Per Petterson? Out Stealing Horses started it all. I heard about the book from the U.K. publisher, an imprint under Random House U.K. Their rights director knew I was looking for translations. She told me she thought I would really like this book, and she sent over a bound galley. It was a lovely package and three of four of us at Graywolf immediately fell in love with it. That book ended up on the front page of the New York Times Book Review and was picked as one of their best five novels of the year. It put Petterson on the map and created a lot of interest in him here. So much so that we have felt confident enough to join again with Random House U.K. to publish Per's backlist. 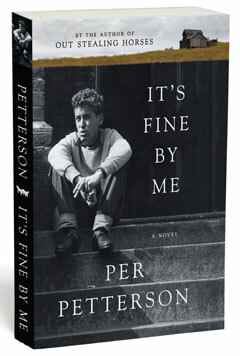 It's Fine By Me is Per's first novel, and is only now being published in English for the first time. 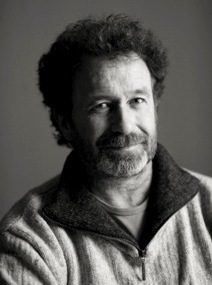 He is edited in England by Random House editor-at-large Geoff Mulligan, who reads the book in German to help him get closer to the Norwegian. He and Per go over the translation together via Skype. They work on it for weeks on end until Per gets the English to his satisfaction. What aspects of It's Fine By Me spoke to you most? Per captures so completely the heart and mind of his teenage characters in this book. They are old enough to drive, but not quite wise enough to know what exactly is going on. Audun, the central character, has a troubled life, and he has great resilience in figuring a way out for himself. Per captures Audun's teenage vulnerability and his determination to be brave so well. He has enormous empathy for his characters. When I think of this novel I think of the threat of Audun's father, the responsibility Audun feels towards his sister, and I think of the drive the two boys make in the snow to face a particular danger. There are a lot of emotional moments throughout the book, and Per handles them all masterfully. Finally, a real pleasure of the book is to see Arvid (from Out Stealing Horses) as he appeared for the first time. Per goes on to use him a lot in his fiction. 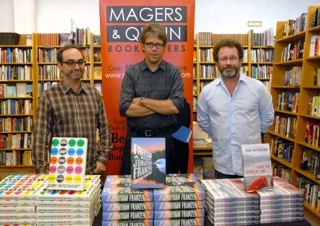 Per Petterson (r.) with Gary Shteyngart and Jonathan Franzen at Magers & Quinn in Minneapolis in 2010. Like Petterson, Audun goes to work in a factory and begins writing at a young age. Are there autobiographical aspects to It's Fine By Me? Per is very proud of his working-class roots and he has that in common with most of his characters. Audun reads quite a lot and wants to be a writer. One feels, too, that Per lived with the integrity and personal grit that Audun displays. But I am certain that Audun's family is not autobiographical. Over the course of Per's work, it is the character Arvid with whom he most identifies. But of course, he is not any one of his characters absolutely. How does the process of selecting a translator work? In the case of Per, the U.K. publishers make the selection. I think all of us who work in the field of translation go by reputation and trust. If we have worked well with someone, we look to repeat the experience. We get samples in advance to check that the translator has a good feel for the work, and then we often look at the work after a chunk has been translated, just to check for any repetitive glitches. We would rather read every language ourselves, but it is beyond us, so we rely on trusted readers and translators. It is quite exciting, waiting to read the first English draft of a book that we have signed up in a foreign language. What is it like to work with an author who doesn't write in English? Foreign writers are mostly very excited to be published in America--it is an important market for them. Per Petterson has become quite close to Graywolf and has visited the States twice, so we have managed to spend quite a bit of time together. It is also very gratifying to connect with a foreign writer's publishers across the world. In Per's case, we had a dinner at the annual Frankfurt Book Fair and invited his publishers and editors from about six or seven different countries. We were all connected by our enthusiasm for this one writer. Can we expect further Graywolf/Petterson collaborations?